Rather than waste your time with pop-culture books about men and women, how about read books with real science and insight this holiday season? 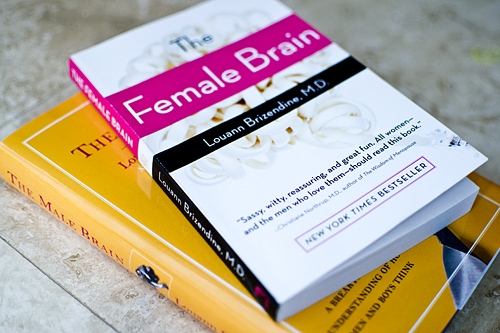 This is a review of two delightful books called "The Female Brain" and "The Male Brain" written by Louann Brizendine. Dr. Brizendine is a professor at UC San Francisco. Both books talk about the peculiarities of each brain from a scientific viewpoint. The books are scientifically accurate, and are accessible to a layperson with no background in neurology. The books contain a lot of insight about the behavior of both men and women. For example, The Female Brain talks about how women's brain is highly geared towards social connections. It provides many examples to demonstrate this, and talks about the development of a female brain from a newborn to adult and to a mature brain. Along the way, you see the various changes in the brain. A lot of behavior changes accompany the development of the brain. This book made me understand the motivation behind the baffling behavior of friends and relatives. The Female Brain was the earlier book. Recently, Dr. Brizendine wrote The Male Brain. The second book is as interesting and as revealing as the first. It talks of the development of the male brain through the years. There are many ways in which the adult male brain is different from the teenage male brain. Reading about the male brain allowed me to better understand how I will change as I grow older. It also allowed me to understand male toddlers behavior. Both books are a quick read, they make cutting-edge scientific research accessible to everyone. This is scientific writing at its best.